Longstanding social impact organizations bring several important strengths to the nonprofit sector, such as decades of experience, corporate and community partnerships, and the trust of both donors and beneficiaries. Their existing relationships and programs enable them to mobilize individuals, groups, and even governments for good. But large, established organizations also must adapt to emerging fundraising trends and donor preferences. TechnoServe, which has helped people living in poverty build competitive businesses, farms, and industries since 1968, is one such organization that is evolving to meet the challenges of modern fundraising and donor engagement. We spoke with TechnoServe’s digital marketing associate Virginie Combet to find out how they are using smart marketing and communication strategies alongside Classy’s fundraising suite to cultivate new and old support. With the right tools, organizations like TechnoServe can delight donors, adopt modern best practices, and attract the next generation of supporters. Inspired by a year volunteering in Ghana, businessman Ed Bullard founded TechnoServe to empower people in impoverished communities to thrive. But each community in the 29 countries they work in faces different conditions. That’s why TechnoServe identifies each area’s market opportunities and helps empower hardworking men and women in the community to create successful farms and businesses. Focused on long-term scalability, the nonprofit adapts and responds to the needs and capabilities of the people they serve. Current fundraising trends show, however, that longstanding nonprofits must bring this same adaptability to their development efforts. Online donations have consistently grown over the past few years and millennials in particular prefer to donate online. In fact, 75 million millennials are set to become a huge force for philanthropy in the coming years. This means even large, established organizations like TechnoServe need to prioritize online fundraising. Since partnering with Classy in January 2016, TechnoServe has integrated mobile-responsive online fundraising with their direct mail strategy, bolstered their monthly giving community, and began tapping into the power of peer-to-peer fundraising. TechnoServe has been telling compelling stories about the people they serve for decades. Online fundraising just calls them to translate the stories they have been using in direct mail into digital mediums. Rather than reinventing the wheel, Combet explains that “it’s more about merging the two together to make sure online and the direct mail communications are coordinated.” That’s why TechnoServe creates donation pages that give a consistent experience to donors referred from direct mail. Because Classy puts TechnoServe’s brand first, the nonprofit can remind donors of their impact every step of the way. Supporters can then complete their donations with confidence. With 86 percent of people aged 18 to 29 using a smartphone, today’s nonprofits need mobile-responsive fundraising pages so the next generation of donors can give back anywhere, anytime. For many longstanding organizations like TechnoServe and Heifer International, direct mail is still a very important fundraising channel. While they need to empower online donations, integrating direct mail and online fundraising allows them to retain donors who are accustomed to direct mail but also simplify and expedite the giving process for others. Monthly giving is not a new idea; people have made recurring donations to the causes they love for decades. 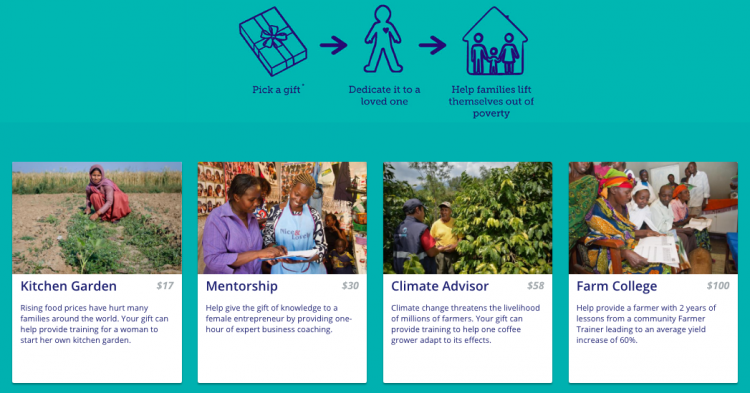 But online fundraising software makes monthly giving easier to set up and manage. Supporters simply choose their gift size and enter their payment information once and the organization receives ongoing, sustaining support. For their monthly giving program, Partners in Prosperity, TechnoServe used Classy’s new Impact Levels to break down what different gift sizes will provide. This makes the impact of a monthly gift clear and concrete. Supporters can see their money in action, without ever leaving their living room. Many nonprofit organizations have worked hard to build a strong recurring revenue program. To ensure that support continues, however, you need to give donors the ability to easily initiate and update their gift. 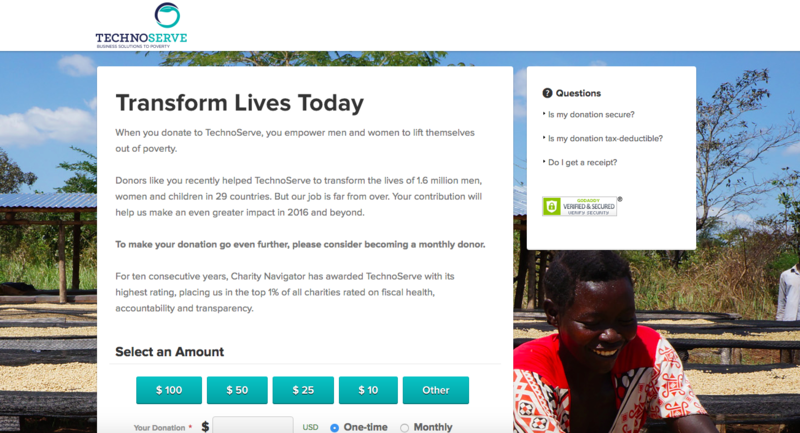 With a beautiful landing page to nurture monthly donors, TechnoServe is creating sustainable revenue for years to come. While modern fundraising technology has helped TechnoServe create a consistent, easy-to-navigate donor experience, it also enables them to explore new types of fundraising. While the organization is still refining the ideal audience to recruit as peer-to-peer fundraisers, they have gotten their feet wet. And since 70 percent of millennials said they’d be willing to raise money for a cause, peer-to-peer could become a powerful tool for organizations like TechnoServe to attract young supporters. To continue to make an impact, established nonprofit organizations must evolve to suit the modern donor. TechnoServe is one of the organizations leading the way.